Dealing with wet as well as drier weather conditions, this Formula 1 race weekend at the Spa-Francorchamps race track has pressured drivers and teams to be quite adaptive. Rain as well as water-covered track surfaces assured two practice sessions Friday where Pirelli slick and rain tires received considerable usage. Qualifying for the Belgian Grand Prix, the changing competition structure due to weather played a role in the three timed sessions. Qualifying started with competitors logging laps on wet weather Pirelli tires as earlier rain dampened the Spa-Francorchamps race course. Early into the Q1, a more dramatic moment during Belgian Grand Prix qualifying was a mechanical problem that transpired on the Mercedes GP car of Michael Schumacher. Being on the top of the practice sheet following the first track session Friday, Schumacher encountered a loss of a rear wheel and tire assembly. The Mercedes GP race machine spun through turn 7 and 8. Such a sudden spin out, Schumacher initially suspected he simply lost control of the race car. Finding some wit in reaction to the lost wheel, Michael Schumacher commented, “Well, obviously I would have wished for a different end to today’s qualifying, but it is difficult to drive on three wheels - even if I should have the experience to do so in Spa." While Michael Schumacher was unable to log a qualifying time, Formula 1 stewards granted the 7-time World Champion and his Mercedes GP car the right to race Sunday. Once the wide Q1 qualifying grouping ended, the Mercedes-powered McLaren of Jenson Button and the Mark Webber's Red Bull-Renault car were the top of the time chart. Clocking a time of 2 minutes, 1.813 seconds around the 7.004-kilometer Spa-Francorchamps circuit in the #4 McLaren, Button led the remaining 17 Formula 1 race cars into the Q2 session. Traditionally faster than the first time trial session, the Q2 qualifying grouping was actually a fraction slower. A drying race track nullified performance improvements made by Formula 1 teams. Almost a 1 slower than Jenson Button's Q1 time, Fernando Alonso led after the second Formula 1 time trial session in his Ferrari. The biggest performance fall-off occurred with the McLaren-Mercedes of Jenson Button. Button was the fastest driver in Q1 but was relegated to a 13th place starting spot for the Belgian Grand Prix. As the Spa-Francorchamps course dried, the 10 remaining vehicles running Q3 session began to undertake a potentially risky move to place slick Pirelli tires on their race machines. With the Belgium race track developing a dry groove, the choice to tread on the Spa-Francorchamps circuit demonstrated an immediate pay-off. Sebastian Vettel, Fernando Alonso and Lewis Hamilton wore the Pirelli optional slick compound in a final time trial attack. While competing in the dodgy course conditions, the final 10 cars performed laps that were around 15 seconds faster on slick tires as they fought for top positions for the Belgian Grand Prix. Taking pole for the Sunday's event, Sebastian Vettel emerged from relative silence throughout the race weekend. Vettel achieved a 1 minute, 48.298 second lap time in his Red Bull-Renault preserving the team's undefeated streak in qualifying so far in 2011. McLaren driver Lewis Hamilton took 2nd place despite an on-track qualifying incident with the Williams F1 car of Pastor Maldonado. As Hamilton's McLaren team members quickly fixed the front wing damage, Maldonado will be assessed a five-grid position penalty dropping the Williams F1 driver to 21st place. Red Bull Racing's Mark Webber captured the 3rd place starting spot for the Belgian Grand Prix race ahead of Ferrari's Felipe Massa. A few surprises in the top-10 includes the Scuderia Toro Rosso team car of Jaime Alguersuari planted in a stunning 6th place. Powered by Ferrari powerplants, Alguesuari is joined close to the front by Sauber's Sergio Perez in 9th position also propelled by the same Italian engine supplier. Also prominently fixed in the 2011 Belgian Grand Prix is the Lotus Renault GP cars. The first competitive run in the team's race car, Bruno Senna will start 7th in his first Formula 1 event since 2010. The second Lotus Renault GP driver Vitaly Petrov will start 10th. 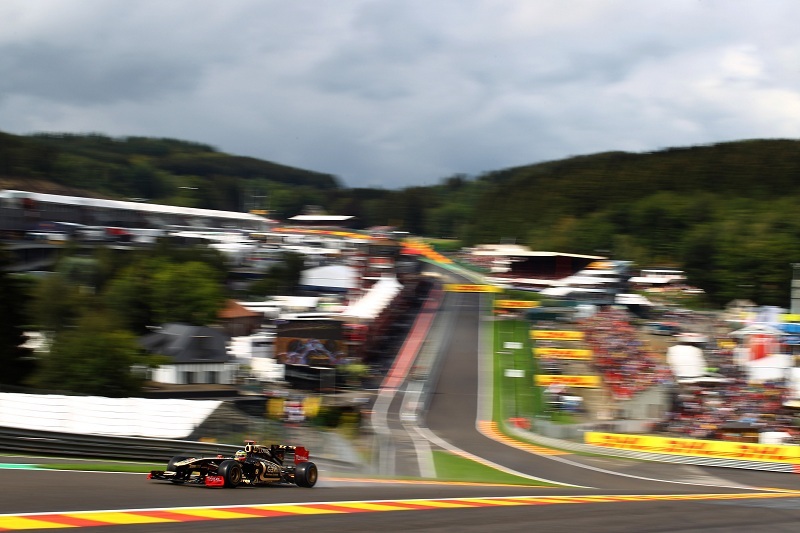 The Belgian Grand Prix is 12th round of the 2011 Formula 1 season set to start at 2 PM local time (8 AM Eastern time). Weather forecasts call for a very cool 44-lap event which could also present the after effects of a rain shower.